King Abdullah, who is currently ruling Jordan, is married to Rania al-Abdullah of Palestinian origin. He is the first king of Jordan who has never had more than one wife. They have four children: (Crown) Prince Hussein (born 28 June 1994), Princess Iman, Princess Salma and Prince Hashem (fun fact Prince Hashem shares a birthday with his dad). 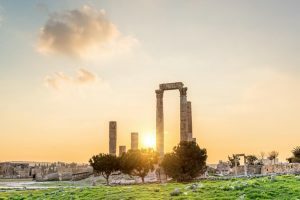 Jordan is strategically located at the crossroads of Asia, Africa and Europe, the capital, Amman, is Jordan’s most populous city as well as the country’s economic, political and cultural center. You can see a beautiful mix of cultural in Jordan, where you can find the beautiful Bedouins with their traditions north and south the country, where people live simple Bedouin lives along with farms and big traditional houses. Jordan has been inhabited by humans since the Paleolithic period. Three stable kingdoms emerged there at the end of the Bronze Age: Ammon, Moab and Edom. Later rulers include the Nabataean Kingdom, the Roman Empire, and the Ottoman Empire. Petra, one of the world’s new 7 wonders originally known to the Nabataeans as Raqmu, is a historical and archaeological city in southern Jordan. The city is famous for its rock-cut architecture and water conduit system. Another name for Petra is the Rose City due to the color of the stone out of which it is carved, visiting Petra is one experience you can never relive anywhere else, starting from the siq where you walk between two reddish stoned mountains, until you reach the treasurer which is a spectacular art piece carved in pink stones, trust me when I say I have seen many beautiful things, but nothing was compared to the moment I saw the first glance of the treasurer! Along with this, Petra has many beautiful places you need to see, (qaser el bnet, el mudarraj, and Indiana johns) and always remember there is so much more to a site than what we can see in confines of a screen or read in black and white letters on a page. 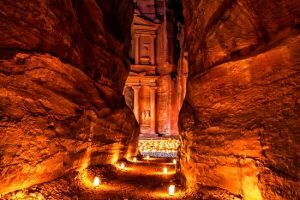 Along with petra, there many magical places in Jordan that are a must go destinations! stay tuned for more articles about the beautiful Jordan!